Nun's Cabin is the just about as close as you can get to Brighton Ski Resort! Located right off of Brighton Loop Road, this is a cozy four bedroom/one bathroom cabin with excellent ski-in/ski-out access. The kitchen is fully equipped with dish ware, pots and pans, cooking utensils, and anything one needs to cook-up meals on your schedule. The wood burning fireplace in the living room provides comforting warmth after a day on the slopes, and makes for a relaxing environment to sit back and enjoy. Three of the bedrooms have queen sized bed and the last has twin bunks, the perfect amount of space for a small family or group size. 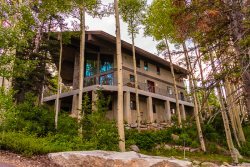 Nun's Cabin is close to the skiing action and a great place to stay in the mountains! Cozy cabin large enough to hold a group of friends and with an unbeatable location for skiing at Brighton. Excellent experience, will definitely plan on booking again! Cant get any closer to the lifts! Very charming home. Spacious and plenty of amenities. Beautiful TV and sound system. Nun's cabin was a great place to stay for our son's wedding weekend. It was walking distance to the venue, had plenty of room, and we had a comfortable stay.